"Don't ask where I'm from / 'Cause I come from a past that's gone," raspy-voiced Minibar frontman Simon Petty sings on "Mill Smoke Black." And it's easy to hear the identity crisis in the band's sound. 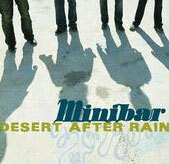 English expats who relocated to Los Angeles a few years ago, Minibar does Americana-tinged music better than a lot of Americans do these days, without losing their own roots. On their 2001 T. Bone Burnett-produced debut Road Movies and this latest effort, they create easygoing, pedal steel-flavored SoCal pop gems that rank them alongside countryman Peter Bruntnell or Scotland's Del Amitri. Five of the eleven songs here were previewed on an EP released last year to tide fans over. Opener "It Is What It Is" has a swirling, hypnotic pop groove. "Unstoppable" is a pretty ballad that morphs into a carnival waltz by its conclusion. It features nice guitar work from Tim Walker, who also supplies the touches of pedal steel that set the mood on "Breathe Easy" and other tunes. Tracks like "Somebody Down Here Loves You" and the album's title song are a little noisier, with soaring Brit-pop style power choruses. But it's the band's adopted home that seems to have made the biggest impact. The spooky mood piece "Badlands" is an homage to Gram Parsons, reportedly inspired by a visit to Joshua Tree. "New Mexico" sounds like Sting transplanted to the desert southwest. There's also the western-themed album closer "Snake Buckle Belt" and Petty singing about driving in the plains of west Texas on "Fragile." Despite a slew of producers, including Rami Jaffee of the Wallflowers, Fly Below the Radar has a fairly uniform sound to it, which may be its only fault. It doesn't have quite the variety of Road Movies and with a lot of mid-tempo tracks, nothing has much bite to it. As a result, none of these songs is likely to storm the charts anytime soon. But this record is never less than listenable, which is more than you can say for a lot of the crap out there. As Petty sings on the title track: "I'm like a broken record� I play the same four chords / I play the same old riffs / And it's hard without hurting." But man, it sure sounds good cranked up as you hit the open road. With Fly Below the Radar, Minibar is likely to do just that for the foreseeable future. That just means they can be our little secret.